IMAGINE MAKING DANCE ACCESSIBLE TO EVERYONE. The Johnstown Concert Ballet announces its next act: JCB Dance Works in the Cambria City Cultural District. JCB Dance Works is a nonprofit, 501(c)(3) organization, ushering in a new phase of operations. At the heart of this new phase is an expansion of our programming and outreach, serving people of all ages, abilities, and backgrounds. To accommodate our new operations, we’re renovating a building in Johnstown’s Cambria City Cultural District, and we’re calling it JCB Dance Works. Dance Works speaks to the scope of what we’re accomplishing – all dance-related works, coming together as a major force in our region to affect amazing changes. We are raising the standard of living through cultural and educational programs, instilling in our young people life-affirming, intellect-broadening humanities, and providing our aging community with life-enhancing activities through dance. The vision for the nonprofit Johnstown Concert Ballet Company is about more than classical ballet. We want to change our region’s cultural landscape with a large-scale appreciation for creative movement in all its forms, and the cultural elevation that comes from making high-quality programming accessible to everyone. Partnerships with other nonprofits in the area will facilitate outreach into low-income schools and programs, so that children of all backgrounds will benefit from cultural enrichment. Partnerships with larger ballet companies will bring in high-profile talent to teach, choreograph and perform. Partnerships throughout the artistic community will bring in cross-cultural events with wide appeal, as well as creative innovations in a safe space for experimentation. All of this benefits our community by broadening our appreciation of new ideas, different cultures, and each other. It looks like KAIROS Alive! – a three-day event filled with seminars on movement and storytelling aimed at keeping seniors mentally and physically healthy. It looks like Some Like it Haute – a wearable art fashion show, bringing together artists in jewelry, textiles and other creative arts for a cat walk extravaganza set to live music. It look like traditional performances that have delighted families for decades, like Tchaikovsky’s Nutcracker, Cinderella, Beauty and the Beast, and an original ballet danced with local hockey players. It looks like scholarships for low-income students with a passion for dance. It looks like ballet and other dance performances in schools and senior care homes and performing arts venues beyond Johnstown. It looks like original dances dreamed up in our new space with up-and-coming choreographers looking to make their mark in the artistic world. It looks like promise and potential and possibility. While the Company has been self-sustaining throughout its existence, the new programing, staff, and building requires capital that we simply don’t have. For the first time ever, the Johnstown Concert Ballet is appealing to the public in a major fundraising effort. 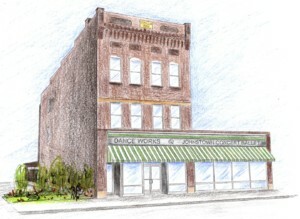 The proposed capital improvements to the JCB Dance Works building are estimated at $1.3 Million. With this undertaking, the Johnstown Concert Ballet is poised to be the region’s formidable leader in dance and movement. We’re off to a strong start, with nearly $60,000 in grants from the Community Foundation for the Alleghenies, most of it from the CFA’s Community Initiatives Fund. We’ve raised tens of thousands of dollars more from local businesses and private individuals. Opportunities for sponsorships abound – from facades to flooring to our Circle of Patrons. We welcome any amount you’d like to give – large or small. And we’d like to work with your organization on appropriate recognition for your generosity. Please be in touch to see how we can work together: E-mail, info@johnstownconcertballet.org. You can make a donation here. Your gift can revolutionize this region’s quality of life. There’s a lot of good happening around us. We’d like to make it dance. Fill out the form below and we will contact you as soon as possible. You can also Email us info@johnstownconcertballet.org.